'The Despicable Deadpool Vol 1: Deadpool Kills Cable' review: Come for the laughs, stay for the laughs – AiPT! Secret Empire left the regenerating degenerate, Deadpool, in a bad spot — hated by the superhero community, the public, his family, and himself. Marvel Legacy followed up Secret Empire with a promise of Deadpool returning to more… despicable ways. That brings us to the newly titled but still ongoing, recently renumbered but soon to (probably) be re-renumbered Deadpool series: The Despicable Deadpool. The Despicable Deadpool Vol. 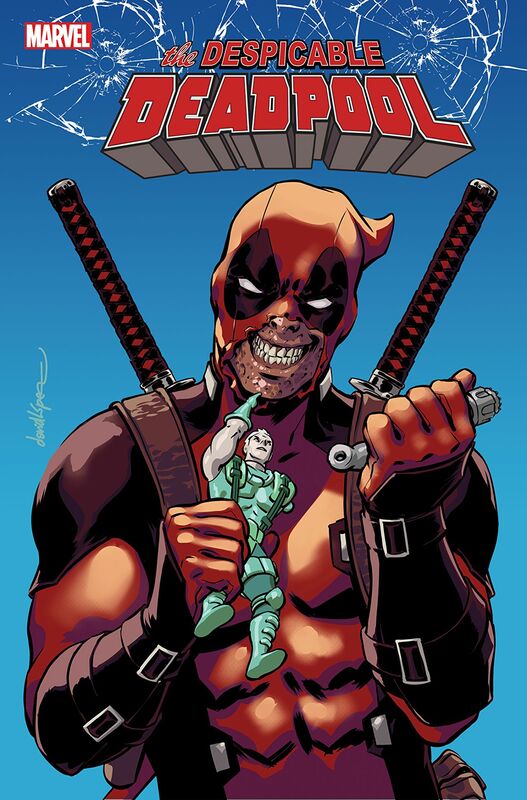 1: Deadpool Kills Cable compiles the first five issues of the post Legacy series where Deadpool kills Cable. Seriously. For real. He cuts Cable’s heart out and the entire ride leading up to this moment is a hilarious good time. I’ve really enjoyed writer Gerry Duggan’s work on Deadpool and this new arc is exemplary of Duggan’s expertise writing the character. Humor is frustratingly hard to convey in writing, yet Duggan manages to hit my funny bone on nearly every page. Actually, I tallied the amount of pages I read without a chuckle — only 17 pages out of 136 left me chort-less. Throughout this five issue arc Deadpool spouts incessant jokes that readers have come to love from the merc with a mouth. As always, Deadpool’s non-stop comedic banter interlaced with Cable’s deadpan demeanor result in plenty of laughs as Wade endlessly grinds down on all of Cable’s gears. My favorite of their arguments comes in the very first issue while Deadpool tries to kill Cable, who points out “…when we first met, you were trying to kill me. Now history repeats itself.” It’s a subtle wink from Duggan, acknowledging the rehashed story arc, before Deadpool comes over the top explaining “It’s almost like I have a Legacy of trying to kill you!” If you saw the title and tweeted “Gawsh Marvel I’ve read this before,” Duggan makes it clear he knows you have, and he doesn’t care. Though this is a Deadpool book, readers learn a lot about Cable’s relationship with Wade during this story. Despite constantly telling Wade how much he hates him, Cable goes to the literal end of the universe to help Wade out, which makes this story’s ending pretty heartbreaking. Cable really has a soft spot for Wade despite his constant exclamations to the contrary, a soft spot that ends up haunting him. There are too many laughable quotes from this issue to count — Deadpool shouting “Fatality!” and “Hadouken!” at people as he punches through their faces, or how he ribs Cable for his seemingly endless amount of pouches. My biggest complaint is that Marvel has yet to make Deadpool a MAX series, so all the swearing is relegated to the “$@#$@%” hieroglyphics of the Comics Code Authority days. I know that vulgarity is supposedly indicative of a lackluster vocabulary, but a hard “f--k” or “m----------r” will always make me laugh harder than “@$#% you!” It’s a book for adults, Marvel, we can handle a bad word or two or 30. Even with the avalanche of hilarious quips and references, the funniest moments come in visual form thanks to the excellent art from Deadpool vet Scott Koblish and colorist Nick Filardi. The funniest scene in the book has zero dialogue in it — with Deadpool, Cable and Stryfe locked in a Mexican standoff — but still had me giggling thanks to the detailed facial expressions drawn by the art team. The fight scenes are not only some of the most joyously violent in current comics, they’re also pretty damn funny. In one skirmish, Deadpool uses a severed head as a dodgeball before disemboweling the unlucky goon who catches it. Then, in possibly the most bonkers sequence of 2017, Deadpool rides a dinosaur into battle with his guts spilling out while wielding a severed raptor talon aka “knife foot.” It’s something that can only happen in a Deadpool book and it’s brought to hilarious life by Koblish and Filardi. Occasionally there’s too much going on in one page, making the fight scenes tricky to track, but the hilarity of the clearer scenes make up for it. It’s when the jokes aren’t flowing that this issue stutters. There haven’t been voices in Deadpool’s head for a while now but that doesn’t mean Wade doesn’t talk to himself. His monologues lack any humor and tend to sound more like Wolverine’s grumbling thoughts from the 80s. I was also holding out hope this relaunch would send Deadpool back into the zany madness of the Daniel Way days where he’d argue with the voices in his head instead of monologuing. Sadly, the voices haven’t returned. There’s far more to enjoy about this arc than there is to complain about, though. I laughed out loud damn near every page while thoroughly entertained throughout the 136 page collection. Deadpool Kills Cable isn’t a game changer or defining arc for either character, but it’s a laugh riot that I’d definitely recommend to fans of either character. The Despicable Deadpool Vol. 1: Deadpool Kills Cable is a nonstop laugh riot that is entertaining throughout. Nearly every page has a laugh out loud scene or dialogue exchange. Despite his demeanor, Cable really cares about Deadpool and goes to extreme lengths to help him. The fight scenes are incredibly violent and often times funnier than the jokes being written. Deadpool really does kill Cable -- no marketing gimmicks here. On a couple occasions the art is a little too chaotic. I miss the voices in Deadpool's head. Deadpool really needs to be an uncensored book -- enough with the "@#$%" in place of swear words.